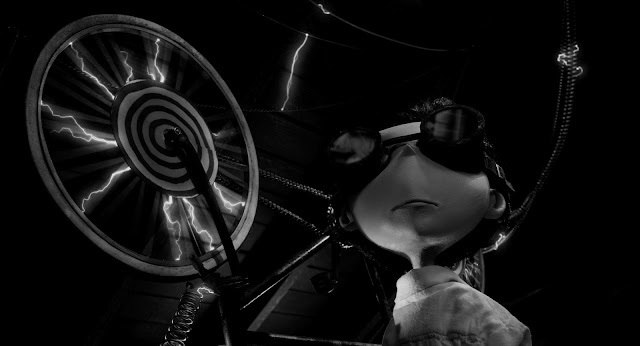 Here are a few new stills from Tim Burton's second film to be released in 2012 'Frankenweenie' a black and white 3D stop-motion remake of his own short film. 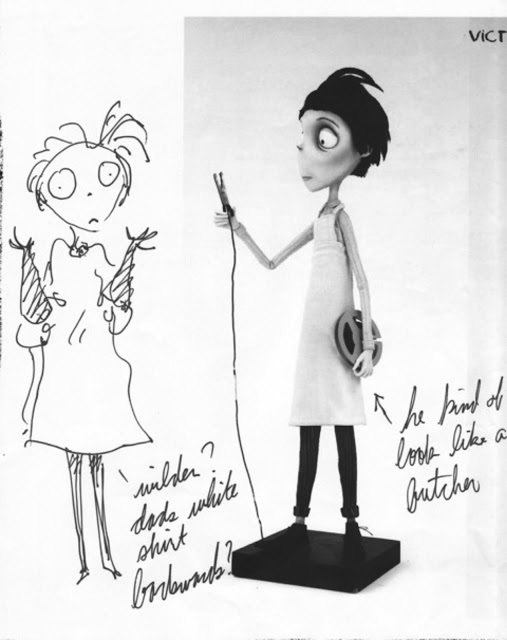 Also below is a interview on shocktillyoudrop Tim Burton about Frankenweenie on his other future projects which is below. After unexpectedly losing his beloved dog Sparky, young Victor harnesses the power of science to bring his best friend back to life—with just a few minor adjustments. He tries to hide his home-sewn creation, but when Sparky gets out, Victor's fellow students, teachers and the entire town all learn that getting a new "leash on life" can be monstrous. The film features the voice talents of Winona Ryder, Martin Landau, Martin Short, Catherine O'Hara, Conchata Farrell, and Tom Kenny. It opens October 5th 2012. 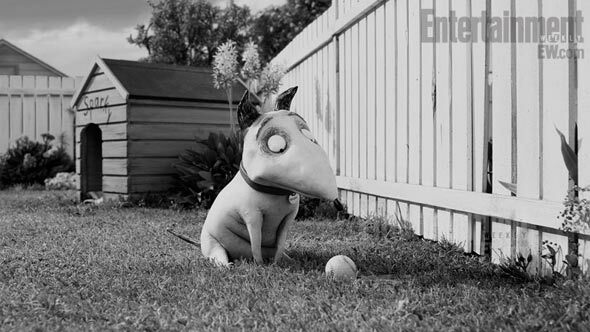 When did you decide to turn Frankenweenie into something more? 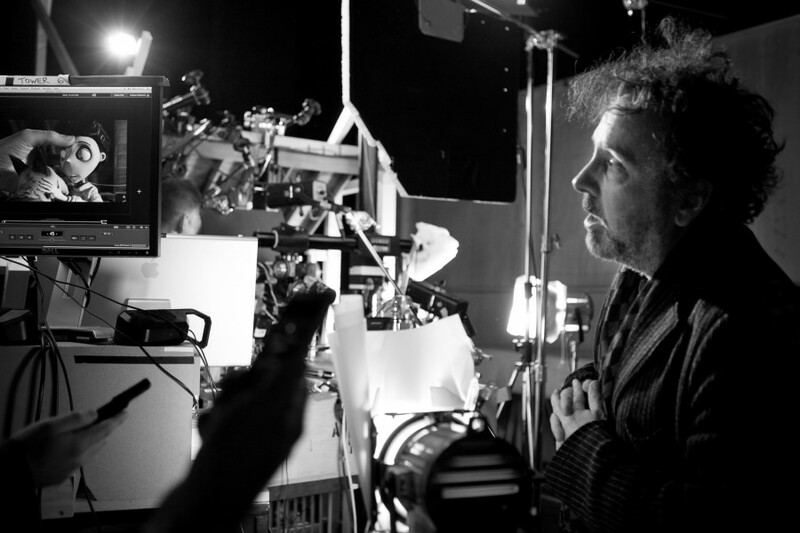 Tim Burton: Probably way back because I’ve always added little things. 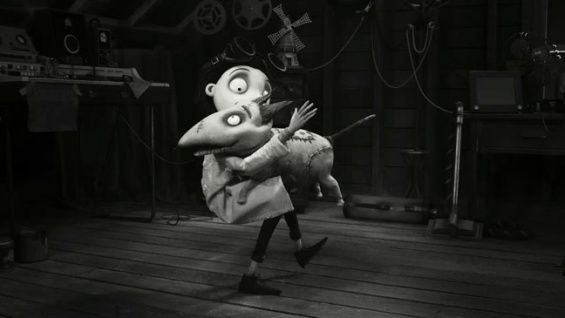 It’s funny because when we did the first short we thought without much trouble this could be more of a feature, but it felt like that story -the boy and his dog so that’s where it took a few years to kind of do the house with Frankenstein kind of Abbot and Costello Meet Frankenstein kind of mix up. 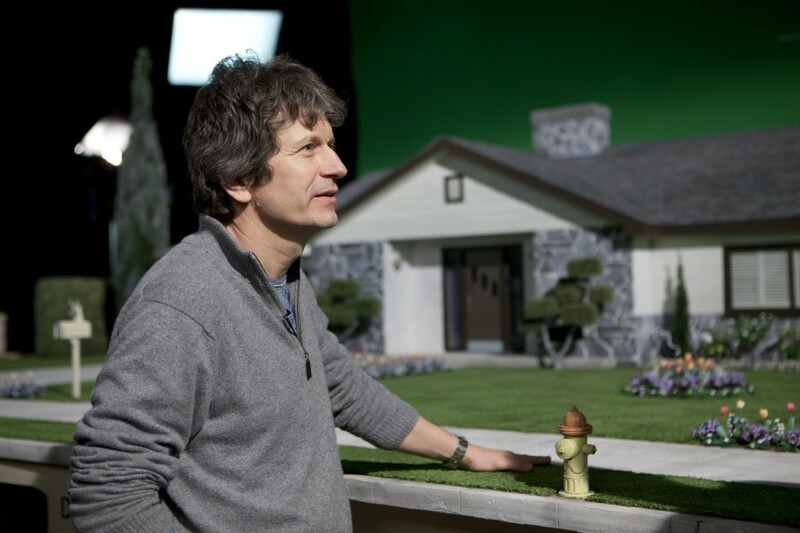 The beginning of the film is the same set up to the original; so how much fidelity does the feature have to the short? Burton: The core was that. That’s the through line of the story. We just tried to weave in the other stuff as naturally as possible. One of the things that I was also interested in this rather than the original was kind of going back to the classroom sort of a kid’s politics and a sort of rivalry with kids. 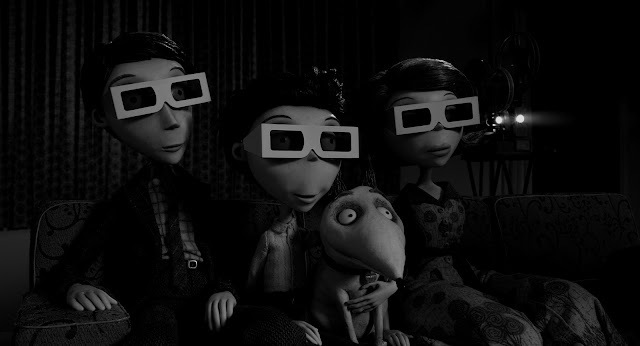 You know that kinds of world seemed to kind of work with the house of Frankenweenie motif. We tried to fold that in naturally so it didn’t feel like two different stories. The original boy and his dog story is the root of it. Can you talk about your personal aspect to the storyline and where the idea came from? Burton: Well, as I recall that sort of first relationship with a pet usually. It’s that sort of unconditional [love.] You walk out of the door and walk back in and it’s like you’ve been gone for three years. And then also because animals usually don’t live as long so there’s a first kind of pure relationship and then first death that I experienced. That was a very powerful combination. I think that’s where the story came from- the idea of never forgetting the emotion and trauma of losing that kind of relationship, but easily relating it to the Frankenstein story which is another love. It’s easy to kind of marry the two things without it seeming like a stretch. Was there a specific dog you’re referring to? Burton: Yeah, yeah I had a dog. Burton: It was around the time of about six to 9. Five to 9. That kind of thing. It wasn’t like having a gold fish. If I had been in love with my gold fish then I might need some help. At least a dog is slight different and you have more going on. Talk about casting this film? Was it purposeful that you decided to work with people you haven’t before? Burton: Well, yeah. There was a little something to that, because again this is something such a personal thing that I kind of wanted to do whatever I could to keep it personal. Always with the voices, they have to be right. Obviously with Martin [Short] and Catherine [O’Hare], they’re so good that’s why I had them do like three voices each. To me, there’s a great energy with that. And with Winona [Ryder] I hadn’t seen for many years so anything like that just makes it that much more personal. Would you say this is your most personal film yet? Burton: It’s probably close. It’s got all elements stuffed in there. Probably close-ish. How has this medium changed for you? Burton: It hasn’t really changed - that’s the thing. It hasn’t really changed since the beginning of film. That’s the great thing about it. There are a few tools that help, but the great thing about this medium is that it doesn’t change. The people who like doing it, that’s the thing that they like about it. Technology -there are a few things that make it slightly easier to gauge and monitor. You’re sole director on this project, is it different? Burton: No. We’re always trying to do these things on a budget so I think in the case of this, the whole goal of this was to try to reign it in a bit - not hire too many and keep in more in house. We wanted to keep it as personal and handmade as we could. Creatively, it is exhilarating to work on something that’s your own verses existing material? Burton: Yes and no. The thing is with anything you make it your own. Even if you’re getting something that the studio sent you or it’s based on another book or story, I think at the end of at all, you try to make whatever it is your own. Even with this kind of thing, it’s based on love of the horror movies. Everything is based on something in some way. Are you hoping younger audiences will want to explore this genre? Burton: I think so. It is interesting because even with my own kids, the world changes and video games and things are so much faster. You kind of wonder how to kids will react to these old Frankenstein [movies], they’re very slow. It’s not a rhythm of contemporary. It is quite fascinating to see how kids respond to anything, but it’s interesting with these old horror movies. 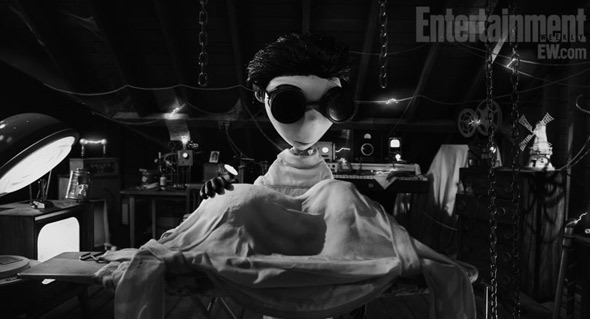 Burton: I always think with references, you never do them just to do them. I just always try to have them in, but if you don’t know them, then it just goes by in the stories. It shouldn’t have to be a thing where you have to know what it is. Earlier you mentioned the handmade quality of this film. You could make a movie that looks this in a computer, but it wouldn’t have that same quality. Is there a degree of almost striving for imperfection? Burton: That’s a good point. It is an interesting point because you’re right - technology can blur the lines. We had such good puppets on ‘Corpse Bride’ and a lot of people thought ‘Corpse Bride’ was computer which it isn’t. Once you start blurring the lines, it gets into a problem. There’s great computer animation. There’s great drawn animation. There’s great every kind of animation. What you like about a certain form, you don’t want to lose that. We tried to let our budget limitations work for. A lot of it is kind of rough, but that’s what we love about it. You just kind of go with it. 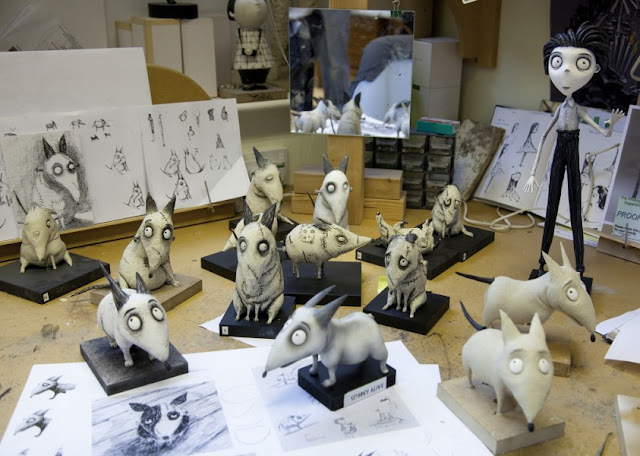 Would you like to make a more traditional kind of animation film? Burton: Well to me, this is the most traditional you could possibly do. Well as far as hand drawn or like a Pixar type of film? Burton: No. I think some things are best computer. Some things are best this, some things are best drawn. I think you just try to pick whatever the right project [is]. I always want to keep ahead in this because I love it as a medium. Can you talk about working with your original drawings of Sparky that were so personal to you and then working with corroborators? 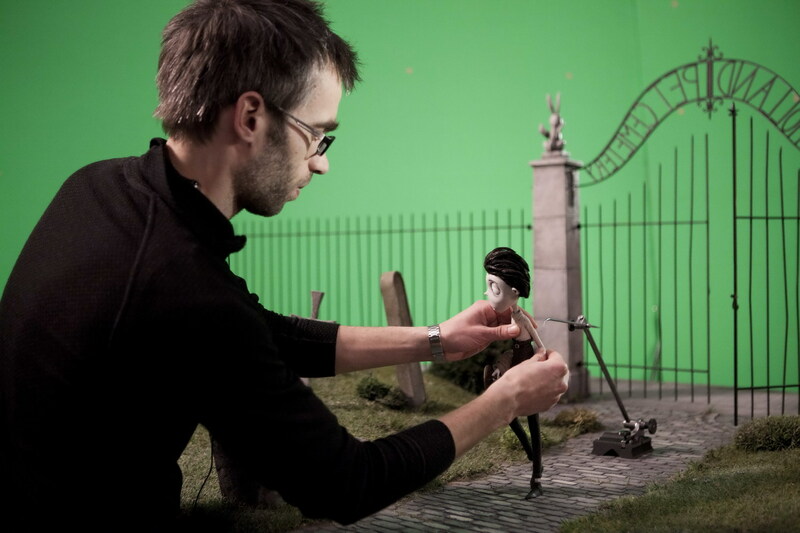 Burton: Just the nature of stop-motion. Things change. You can do a drawing and when they start to make the puppet, the drawing doesn’t work. There is a constant back and forth in terms of what it kind of comes out to be. That’s just a normal corroboration. It doesn’t feel that different to anything else in a weird way. It’s like what fabric moves? What fabric stays? Does it have to be replacement? All that kind of stuff is normal. So it just becomes part of what it is and what the final outcome of it is. Speaking of Sparky, he bears a resemblance to the dog from Family Guy. Was that intentional? The kids in the classroom look and sound so vastly differently. Did you try to make them look all different? 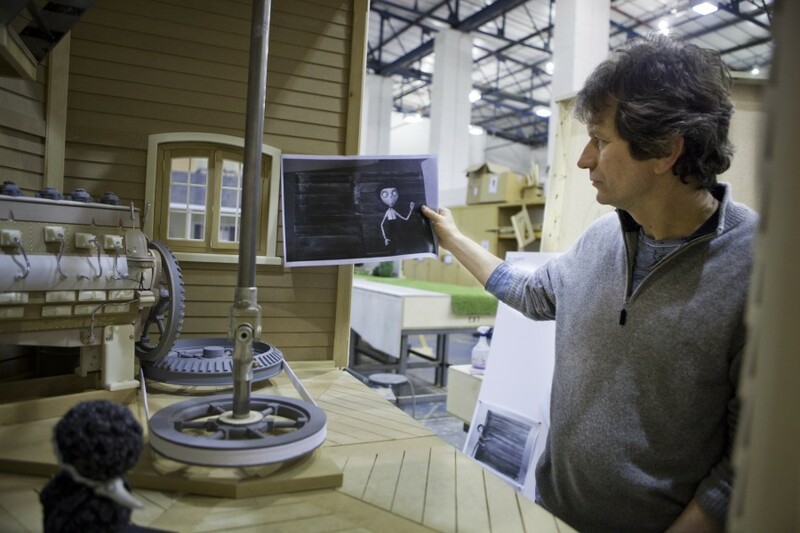 Burton: Yeah, it’s always based on a sketch or drawing, so there’s a certain amount of things are hopefully similarly in the design. The design again is usually organic. It’s not like this was based on a book and we’re going to lovingly recreate every illustration so it starts that way from the beginning. How is directing this different from directing live action in terms of your personal man hours. Are you there all the time? Burton: No, no, no no! They wouldn’t want me there. That’s the thing - you get a few seconds a week. That’s the great thing about it in a way for me is that I could be working on a live action film and be working on a crossover like this which I actually find it really stimulating. The good thing about an animated is if something is not working, then you just fix it. Usually you can fix it before you even get there because you’ve got the board. You’ve got things more planned out. Everything is sort of there. You kind of know what you’re getting. The only other element you get, and hopefully it’s a good surprise is when an animator animates it well. Usually it’s at least okay. Usually it’s good, but sometimes it’s not. It’s just like anything else. Do you have to put a lot of trust in the people you’re working with? Burton: Yeah, but no more than anything else. Live action is different because it’s a quicker animal. With stop motion you plan it. The element of surprise isn’t as much in there as it with live action. 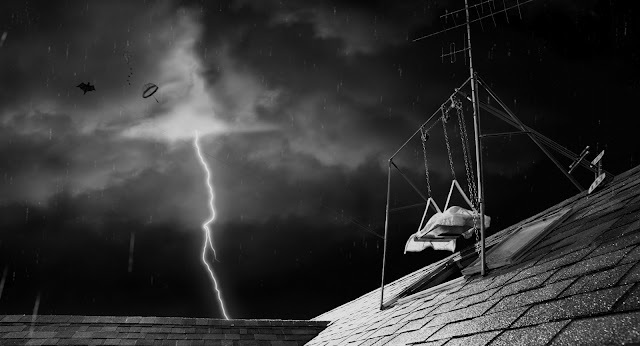 What was it like directing this nearly 30 years after the original short? Is it like writing a poem as a kid and then trying to make it better? Burton: Not so much better, because I’m not about "the effects are better so now we’re going to go back and update the effects." Not better, but in a different way since you were just a 25-year-old kid? Burton: Yeah, and also it’s different too, because like I said, I was grateful that that was live action because if it had been animation, I probably wouldn’t have gotten into live action so it was a very kind of lucky break in a way. Now with the animated version, it makes sense. I think there are enough new elements and because it’s a stop motion medium, it’s a different medium; it feels like something that is personal. It definitely felt like something new. I didn’t feel like I was treading over old territory. It was a way to explore it a different way. Don (Hahn) was telling us that the 3D post convert on this was easy to submit because you could send the companies different layers and stuff. What was that like because this seems much different than Alice in Wonderland? Burton: Whether you shoot it or it’s conversion, which I think either way you do it, both need time so you can see a bad 3D or see a bad conversion. I think it’s just a question of spending the time with it. The great thing about this, which was the same on ‘Nightmare,’ it doesn’t get any clearer than this in terms of what the sets were and the positions and distance. All the information is there for our conversion to make it what it needs to be. At any point during casting, did you reach out to Daniel Stern or Shelly Duvall? Burton: No. They were great. There were certain elements that I thought were appropriate to kind of do as was and then there were certain other elements that made it personal for other reasons. Working with Catherine and Martin and Winona - they weren’t on that project, so it’s a similar thing, but in a different way. Stop motion animations take a long time so I’m sure this was on the schedule for a while, but was this any sort of reaction to how difficult it was to do Alice and Wonderland and other huge productions that you’ve been working on? Burton: First of all, I wouldn’t plan it to where they all come out like this. That I definitely wouldn’t plan, but Frankenweenie has been in the works for a long, long time. I think the joy about that is that it’s smaller. You kind of look at the shots and what you see is what you get which is really nice. That again is what is so nice about this medium. I can see why animators as hard as it is, can get energized by it. They’re moving something then you see it come to life and it is cool to have that energy. How much more work do you have on this? What’s your involvement on Bettlejuice 2? Burton: Seth [Grahame-Smith] is writing something. I just told him because I liked the character that I just thought I’d have a better response if he has ideas about it to just let him [work on it]. If you like what Seth does, would you be interested in the project? Burton: If it’s interesting. I don’t know if I’d ever know a good script if it bit me in the face, but I know what I like. Can you talk about the speech in the footage we saw and how there’s a lot of talk of New Holland being suburban Burbank? Burton: Well, that’s the way it was. The whole point was to try to recreate that feeling and the vibe and that kind of community. I think that’s why I always related to Frankenstein’s story to my own upbringing because it was so easy to make the angry villagers your neighbors because it was that kind of town. It was a kind of angry mob mentality every now and then. It was all stuff that seemed even though it was in a Frankenstein movie, seemed like real life too. What’s real and not real was quite a blurry line in some ways. 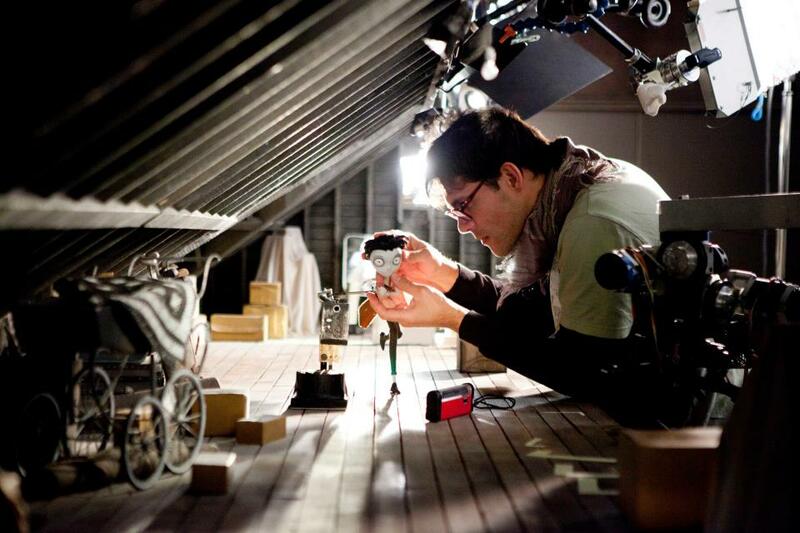 This is the first time you’ve directed a stop motion animated film by yourself. Was that always going to be the plan? Burton: All by myself! I’m a big boy now with no training wheel or nothing. No, these things happen quite organically. I think each project is different. In the case of this one, we wanted to get more handmade so we scaled back on everything. Another project would be different. Each one has its own kind of energy. This one just felt right to make it like this. Less is more. There are rumors of you doing a Pinocchio movie with Robert Downey Jr.
Burton: I’m very busy aren’t I? It’s kind of embarrassing. I’ve got three movies [coming out this year]. I’m sick of me already. So we’ll let these come out, then I’ll go away and you guys can deal with other people. Is Big Eyes still happening? Burton: Oh, I don’t know. There are a lot of projects in the works, but as you can see when something is 10 years in the making, you’re never quite sure when it’s happening. All Hail The New Joker In Town!